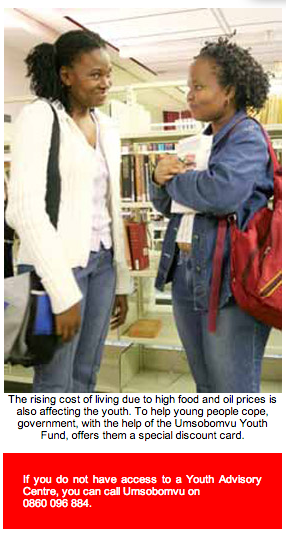 The days of not having enough money to buy textbooks are over if you have the South African Youth (SAY) card. Through the Umsobomvu Youth Fund, government encourages young people to use the card as it will help them to cope with the high cost of living. A SAY card holder can buy certain goods and services at discount prices from a number of stores around the country. The card covers goods and services like learning materials, health, entertainment and leisure, sport, transport, accommodation and financial services from some banks. Apart from discounts, SAY card holders also enjoy other benefits. Umsobomvu uses the SAY card to let young people know about job opportunities that are in line with their skills through SMS, e-mail and the post. Card holders also get information on issues like education, training, health, competitions, starting your own business, selfemployment and business loan applications. 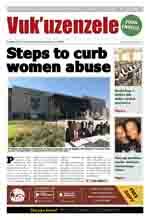 In addition, they are invited to events organised by the Umsobomvu Youth Fund. The SAY card is given free of charge to males between the ages of 14 and 35 years and to women of all ages. The Umsobomvu Youth Fund has 121 offices called Youth Advisory Centres around the country. To get a SAY card, you can go to one of these centres and complete the application forms. If you have access to the Internet you can also apply for the SAY card online at: www.youthportal.org.za.